The tech bellwether, Intel has had some tough trading days in the last few weeks. In My 2012, INTC made an eight year high of 29.27. Since then it has been downhill for the semiconductor behemoth. First, the news came in August that Warren Buffet’s Berkshire Hathaway had dropped its Intel stake. Berkshire shed all of its remaining 7.7 million shares in the three months ending June 30. This coincided nicely with the big advance that INTC had seen since the Fall of 2011. Berkshire had accumulated 11.5 million shares of Intel in the second half of 2011. It made a 25% profit on its investment. Next, Intel warned of sharply lower revenue in early September. The news was a big blow to the stock price, which was trying to bounce off after declining to 24.15 on August 30th – a 17.5% fall from the high of 29.27. Revenue warning arrested that bounce and forced another leg down to low of 22.83 – 22% below the high. However, Thursday’s price action fuels the expectation for a short term bounce. Let’s analyze. Like most technology stock, Intel saw its all-time high of 75.81 during the turn of the century, in August 2000. Then like its other brethren, it collapsed to a low of 12.95 – an 83% loss – October 2002. Since then it has been stuck in a trading range – with a max of 34.60 and a min of 12.05. 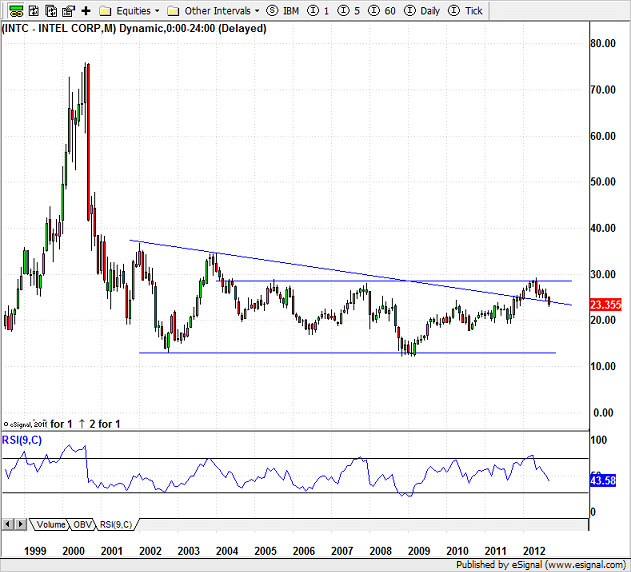 On the monthly timeframe, INTC has formed two patterns – a descending triangle and a horizontal channel. The descending triangle started with the high made in January 2002. The horizontal channel started to take shape in June 2004. In January 2012, INTC broke above the upper limit of the triangle. This is a bullish action. However, in May 2012, INTC hit the upper bound of the horizontal channel and turned back. Now it is knocking on the upper limit of the triangle. Which of these two patterns will prevail is not clear. If the descending triangle break revitalizes after the test of the upper limit then it will be quite bullish. On the other hand, bounce off upper bound of the horizontal channel increases the possibility of a test of the support at 20 or 17.60 or even at 12. On the weekly time-frame, INTC is near a confluence of support zones. The first is the Fibonacci retracement of 38.2% of the advance from the low of 12.05 made in February 2009 to the high of 29.27 made in May 2012. This comes at 22.69. The second support is the 61.8% Fibonacci retracement of the advance from the low of 19.16 made in August 2011 to the 2012 high. This comes at 23.03. The third support zone is enclosed by the low of 22.51 23.05 made in November-December 2011. The fourth support zone is based upon the ABCD pattern. ‘A’ is the high of 23.96 in May 2011. ‘B’ is the low of 19.16, made in August 20911. ‘C’ is the high of 29.27 made in May 2012. The projected ‘D’ – using CD = AB * 1.27 – comes at 23.17. On Thursday, INTC made a low of 22.83. This is within the above four support zones, give or take few cents. Intel is staying above the uptrend line, which started in March 2009 and was touched in September 2011. On Thursday, it made a green reversal candle. The low of 22.83 breached below many support level but the close of above the day’s open. The close was also in the upper half of the day. 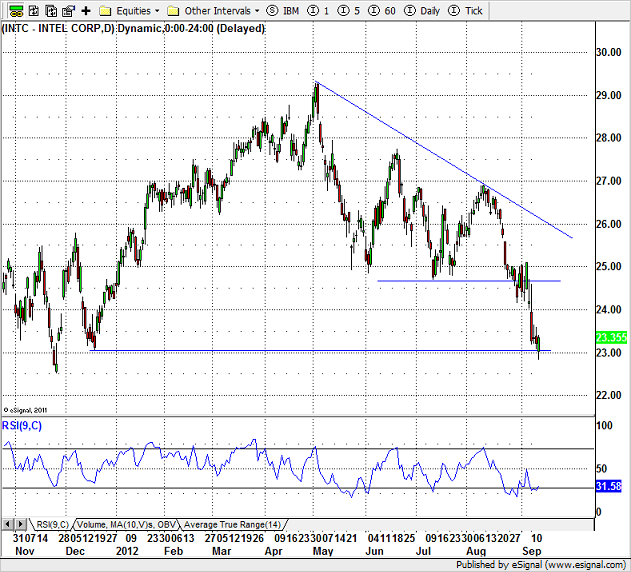 On Thursday, INTC also formed a Trend Channel Line Overshoot (TCLOS) pattern. The pattern has been popularized by Al Brooks. In this pattern, you draw a down-sloping line touching the lows. This is on the other side of a downtrend line, which is also down-sloping but touches the highs. An uptrend line touches the lows too but it slopes upwards. In the TCLOS pattern, the third or fourth candle breaches the line and the next candle goes above the high of the candle that breached the line. This usually signals that the bears are kinda tired and that the bulls may regain the upper hand – at least for a very short while. Previous such TCLOS worked quite well for INTC – August 2010, April 2011 and September 2011. The chart does not show the ones that did not work. 9-Day RSI is showing a divergence. On August 30, INTC made low of 24.15 and RSI had a reading of 21. on September 13, INTC made a low of 22.83 and RSI had a reading of 31.58. 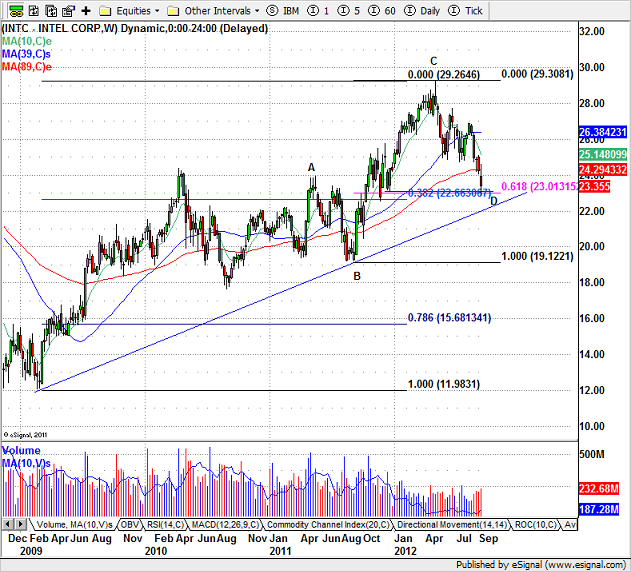 Another chart pattern that INTC formed on Thursday is Wyckoff spring – the price fell below a support (low of 23.05 made on December 19, 2011) and then bounced up to close higher. If the price goes above the high of Thursday than both formations – TCLOS and Wyckoff Spring – will be completed. If that happens then it will be a short term reversal signal. There are some resistance levels hanging above. First one is the broken support of 24.68 – the July 2012 low – and the second one is 25.10 – the high made on September 9, 2012. The entry is above the Thursday high of 23.41. The stop will be either below Thursday’s low of 22.83 – aggressive – or below 22.51, the low of November 25, 2011.